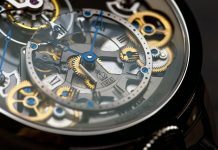 Hybrid watches of one sort or another are becoming… well, not exactly mainstream, but a bit more accepted. Seiko and Citizen have been doing their best with the concept for decades, as has Frederique Constant in their smartwatch. More recently Ressence introduced their e-Crown, an electronic component in the heart of the watch. The Junghans Meister Mega isn’t quite to that degree of horological hybridity, but it’s not far off at all. In fact, it shares a lot in common with the Seiko Astron, namely that it’s an automatically-setting worldtimer. The watch takes its timing cues via radio and will adjust to wherever you happen to find yourself. It is, in other words, the most convenient worldtimer ever. This isn’t Junghans’ first foray into radio-controlled movements; they’ve quite an extensive collection of pieces using similar tricks. This is though the first time it’s been a part of their generally classical Meister series. In fact, the 38.4mm steel case is vintage in both size and style. If you didn’t know what this piece was you’d assume it was just a handsome automatic timepiece. It’s weighty enough. In fact, the only allusion to the technical nature of the Meister Mega is its dial, which hints at its timing speciality with a map printed onto the anthracite. There are more plain versions of the watch, but as far as I’m concerned, it’s a nice touch; it certainly stands out a bit more. 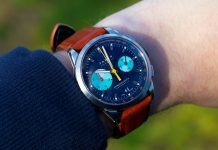 It still retains the Bauhaus sensibilities Junghans has made its name from – kind of like a more accessible Nomos Glashütte – but with a technical air about it, particularly when you flip it over. Most quartz watches will try to hide the fact. It’s kind of obvious why; quartz doesn’t have the best reputation. 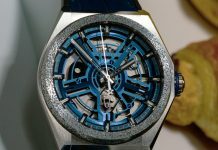 In the Meister Mega, however, that movement is a feature. The entire case back is transparent, revealing the maze of circuitry that makes the watch tick. They’re proud of it, and quite rightly so. You see, Junghans’ phenomenal in-house movement doesn’t just change which time zone you’re in. The Mega’s movement gets constant updates via radio so that it can keep the movement in perfect alignment, making it as accurate as a watch can be, unless linked to an atomic clock. The only problem with my time wearing the Meister Mega was that I didn’t travel enough. Unfortunately travelling from London to Canterbury doesn’t cross into a new time zone. Still, it felt nice on the wrist with its smaller case size and the bracelet is one of the most comfortable I’ve worn. Whether you see the Junghans Meister Mega as a fine watch or a toy depends on what you look for in a timepiece. If you’re after a hand-crafted tourbillon taking hundreds of man hours to build, it’s not that. If, however you’re looking for a handsome, genuinely useful watch for a phenomenal price, look no further. For more information visit Junghans’ website. Share the post "Junghans Meister MEGA Watch Review"